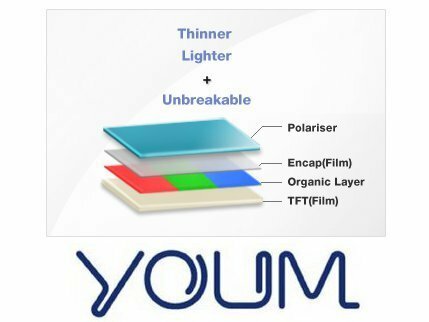 VR Zone reports Samsung is preparing to ship YOUM, a new type of ultra-thin, bendable AMOLED displays. The flexibile AMOLED technology was showcased at CES last year, and at that time, we saw a 4.5-inch screen with a thinness of 0.3mm and resolution of 800x480 (WVGA). Samsung has demonstrated the concept by using it for ebook reading, camera, video chat and even to the extend of augmented reality and 3D visuals on tablet PCs. Recently, many companies are conducting research and development on flexible displays, and LG was the first to go into production of the screen. Last week, Korean company CE has revealed that the company has begun mass production of the world's first plastic electronic paper display.